She is a superstar singer who has been in a relationship with her back-up dancer since 2016. 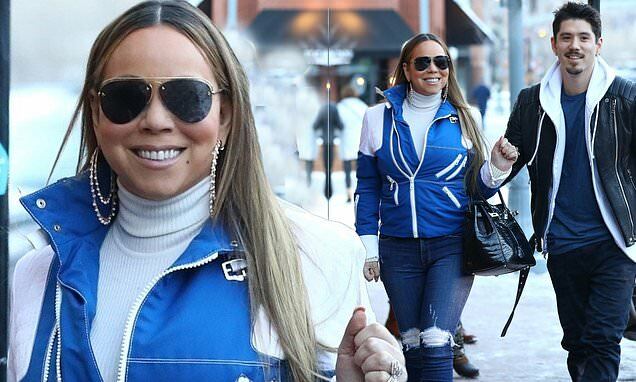 And Mariah Carey looked happier than ever as she stepped out with beau Bryan Tanaka in Aspen on Saturday. The All I Want For Christmas is You hitmaker, 48, was stylish in a cream sweater, paired with a blue and white sports jacket as she strolled with her beau. She paired this with ripped skinny jeans which clung to her toned legs, completing the ensemble with black and gold Dior boots. Her caramel tresses were styled sleek and straight while her pretty features were enhanced with a radiant dusting of make-up. She covered her eyes with a pair of stylish shades.